Supreme Court Considers Disabilities Act Dispute The Supreme Court heard oral arguments Wednesday in a case that asks whether teachers in religious schools are exempt from civil rights laws. The court's eventual decision will have profound implications for the nation's religious institutions and the people who work in them. 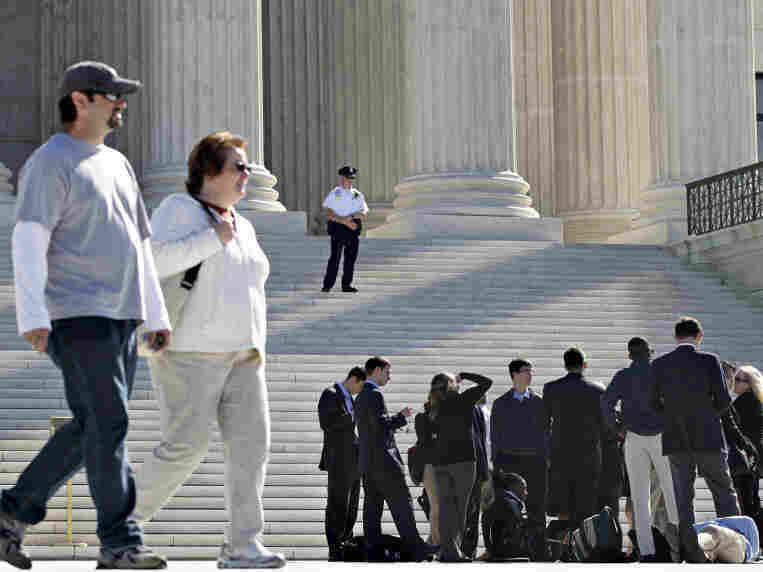 As visitors lined up outside the Supreme Court on Wednesday, the justices grappled with the question of when churches might be exempt from certain federal laws. It could be "a mess," said Justice Stephen Breyer. That sentiment seemed to sum up the intellectual somersaults performed by the justices of the U.S. Supreme Court on Wednesday, as they grappled with the question of who is a minister and when a minister is exempt from federal laws that apply to everyone else. The court's eventual decision will have profound implications for the nation's religious institutions and the people who work in them. The case before the court began when Cheryl Perich, a tenured teacher at a parochial school, took disability leave after she was diagnosed with narcolepsy. When her doctor certified that she was ready to return to work, the school asked her to resign, and when she threatened to sue under the Americans with Disabilities Act, she was fired. The Hosanna-Tabor Lutheran church school in Redford, Mich., does not dispute that it fired Perich for threatening to sue. The school maintains that although Perich taught primarily nonreligious subjects like math and science, she is a minister because she taught one religion course. Under church doctrine, ministers are required to resolve all disputes within the church. Thus, the church argues that Perich violated chuch rules when she hired a lawyer and that she is thus exempt from the provisions of the Americans with Disabilities Act and has no right to go to court to win back her job. But inside the Supreme Court, Douglas Laycock, the school's lawyer, immediately ran into a buzz saw. Justice Sonia Sotomayor asked whether religious institutions are immune from lawsuits when they fire a person on the basis of a pretext. "How about a teacher who reports sexual abuse to the government and is fired because of that reporting?" she asked. Doesn't society have a right to say certain conduct is unacceptable even when it occurs in a religious institution, she asked. Observing that Perich was "fired simply for asking for a hearing," Justice Anthony Kennedy asked whether going through an Equal Employment Opportunity Commission hearing would have settled whether she was actually fired for a religious reason. When Laycock hesitated, Justice Antonin Scalia leapt to the rescue: "I think your point is that it's — it's none of the business of the government to decide what the substantial interest of the church is." Chief Justice John Roberts presented another hypothetical. What about a teacher who teaches only nonreligious subjects, but leads her students in prayer at lunch. Laycock seemed to say that such a person would not be considered a minister. Roberts followed up, noting that some churches view all their members as ministers. Laycock replied that in cases like that, the courts might determine how many secular duties the individual performs. Justice Kennedy, exasperated, said that is exactly the question in Perich's case. That prompted Justice Scalia to ask how a minister should be defined. A person is a minister, Laycock replied, if his or her job responsibilities are "to teach the doctrines of the faith." Justice Ginsburg, unconvinced, noted that Perich's duties at the school did not change between the time when she was a contract teacher — and not a minister — and when she became a commissioned officer of the church. Indeed, Ginsburg continued, the majority of Lutheran teachers are not currently classified by the church as ministers, though many of them teach religion classes. Returning yet again to Laycock's definition of minister, Justice Sotomayor seemed to suggest that Laycock's test in which a minister is "anyone who teaches religion" would include even people who are not members of the faith. She observed that non-Lutheran teachers could thus be classified as teachers of the faith. Responding to that, Justice Scalia asked Laycock whether "you'd be here anyway even if she [Perich] hadn't been ordained." To that, Laycock replied, "Yes." Defending Perich's right to sue was the EEOC, represented by Assistant Solicitor General Leondra Kruger. She faced an even tougher battering from the justices after she asserted that Congress was within its rights in making it illegal to fire a fourth-grade teacher, even at a religious school, if the retaliation was for asserting her rights under the disabilities law. Chief Justice Roberts probed that assertion, asking whether there is "anything special about the fact that the people involved in this case are part of a religious organization." The "basic contours," responded Kruger, "are not different" whether the organization is religious or not. But, she added, the way it will play out may be different. At this, Justice Scalia exploded. "That's extraordinary," he proclaimed, noting that the Constitution does not explicitly protect, say, labor unions. "But there in black and white in the text of the Constitution, are special protections for religion." Justice Samuel Alito observed that the constitutional principle of separation of church and state was designed in part to prevent the government from selecting ministers. Kruger didn't disagree, but said that "what the government does dispute is that applying generally applicable principals to religious employers amounts to choosing a minister." Following Kruger to the lectern was Perich's lawyer, Walter Dellinger. He literally got one word out of his mouth before the justices pounced. Justice Elena Kagan asked Dellinger "why this commissioned minister does not count as a minister," to which he responded that Perich was not a minister because she carried "out important secular functions in addition to her religious duties." Chief Justice Roberts jumped in with an objection.That can't be true, he said. After all, "the pope is a head of state carrying out secular functions." Is he not a minister? Dellinger rejected Laycock's "categorical approach" as sweeping too much into the category of minister. "When a religious organization enters the public arena," as it does when it sets up schools, it is involved with government rules, and those rules have to be applied with neutrality, Dellinger said. In other words, there is no automatic exemption for those the church dubs ministers. Whether the Supreme Court buys that argument remains to be seen.